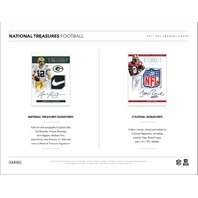 - Look for on-card National Treasures Rookie Patch Autographs with jumbo prime swatches, all sequentially #'d/ 99. 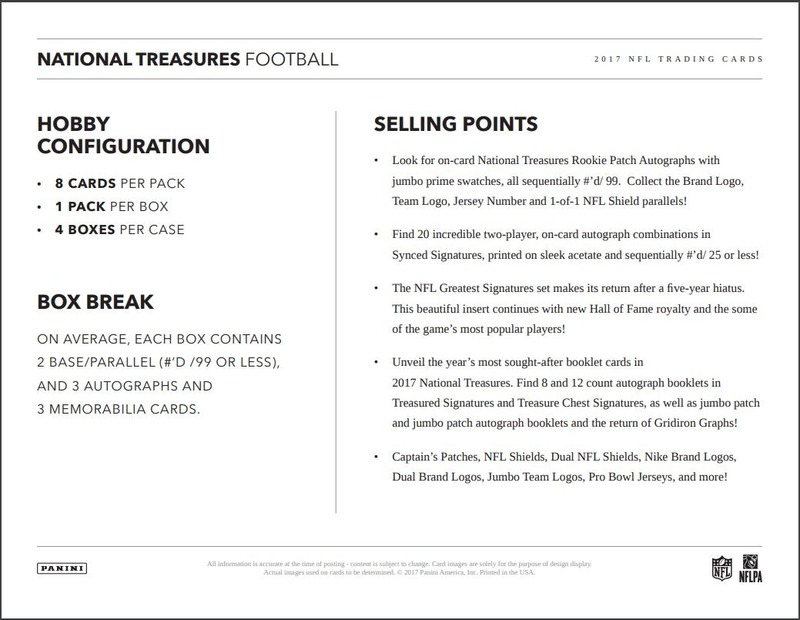 Collect the Brand Logo, Team Logo, Jersey Number and 1-of-1 NFL Shield parallels! - Find 20 incredible two-player, on-card autograph combinations in Synced Signatures, printed on sleek acetate and sequentially #'d/ 25 or less! 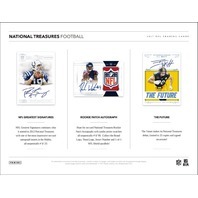 - The NFL Greatest Signatures set makes its return after a five-year hiatus. This beautiful insert continues with new Hall of Fame royalty and the some of the game's most popular players! - Unveil the year's most sought-after booklet cards in 2017 National Treasures. 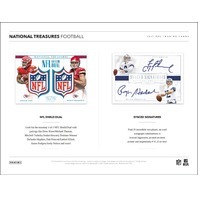 Find 8 and 12 count autograph booklets in Treasured Signatures and Treasure Chest Signatures, as well as jumbo patch and jumbo patch autograph booklets and the return of Gridiron Graphs! - Captain's Patches, NFL Shields, Dual NFL Shields, Nike Brand Logos, Dual Brand Logos, Jumbo Team Logos, Pro Bowl Jerseys, and more! 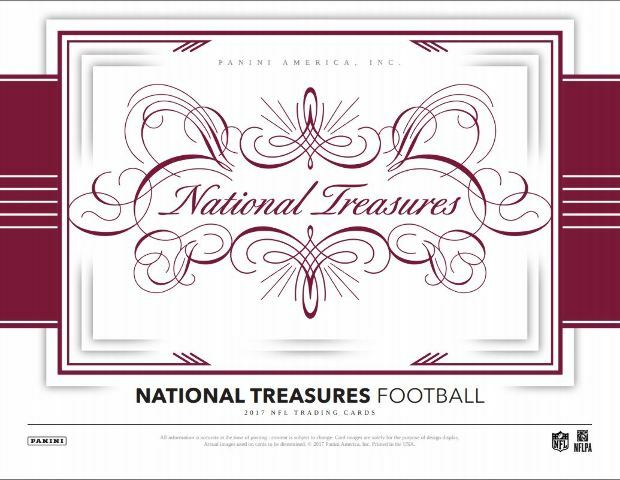 NFL Greatest Signatures continues what it started in 2012 National Treasures with one of the most impressive on-card autograph inserts in the Hobby, all sequentially #'d/ 25! 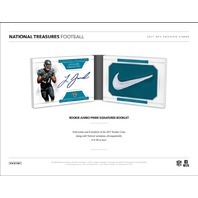 Hunt for on-card National Treasures Rookie Patch Autographs with jumbo prime swatches all sequentially #'d/ 99. 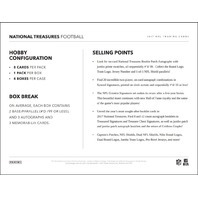 Collect the Brand Logo, Team Logo, Jersey Number and 1-of-1 NFL Shield parallels! 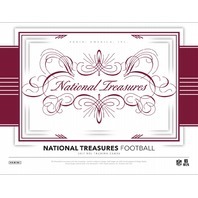 The Future makes its National Treasures debut, limited to 25 copies and signed on acetate! 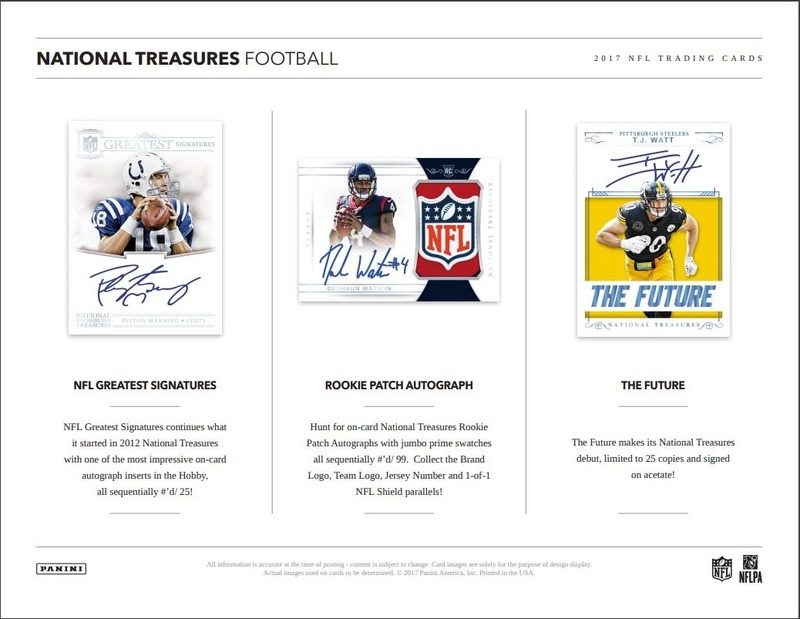 Find on-card autographs of players like Joe Montana, Peyton Manning, John Riggins, Michael Vick, John Elway, Dak Prescott, J.J. Watt and more in Material Treasures Signatures! 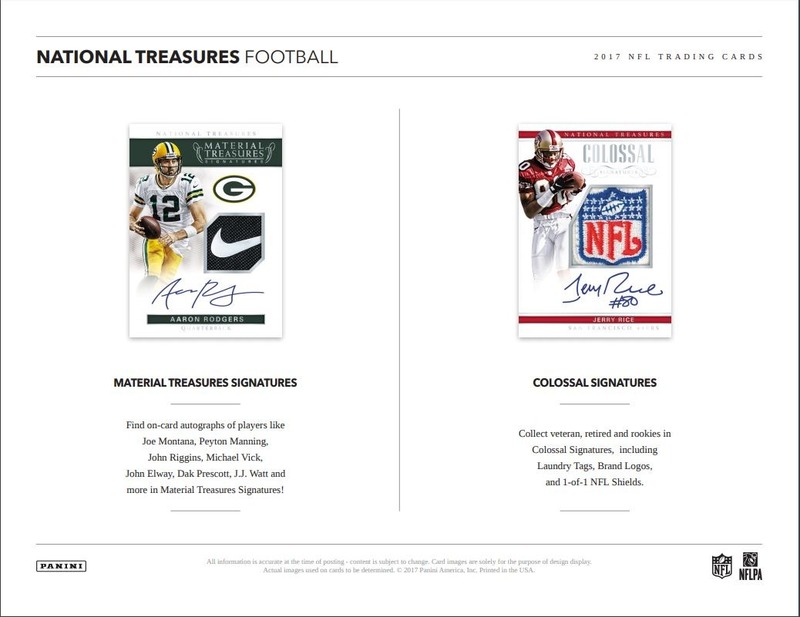 Collect veteran, retired and rookies in Colossal Signatures, including Laundry Tags, Brand Logos, and 1-of-1 NFL Shields. 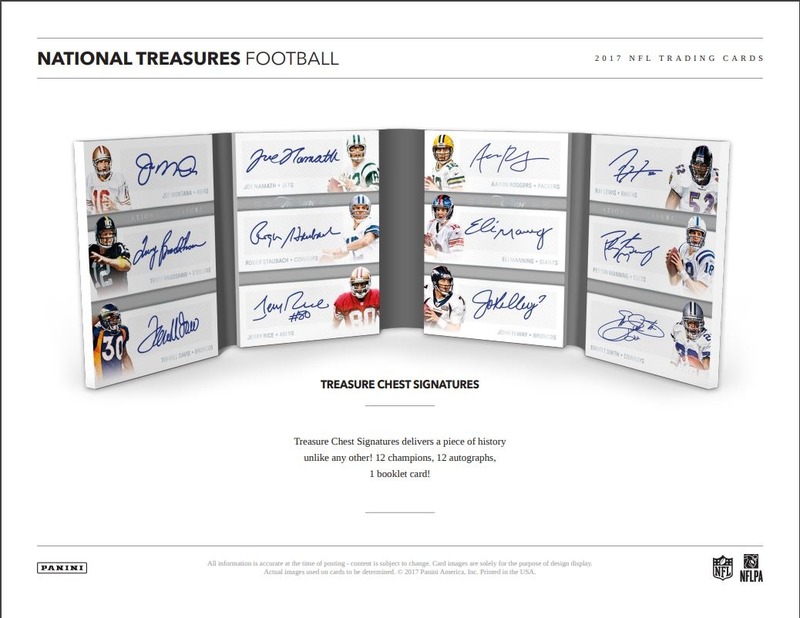 Treasure Chest Signatures delivers a piece of history unlike any other! 12 champions, 12 autographs, 1 booklet card! 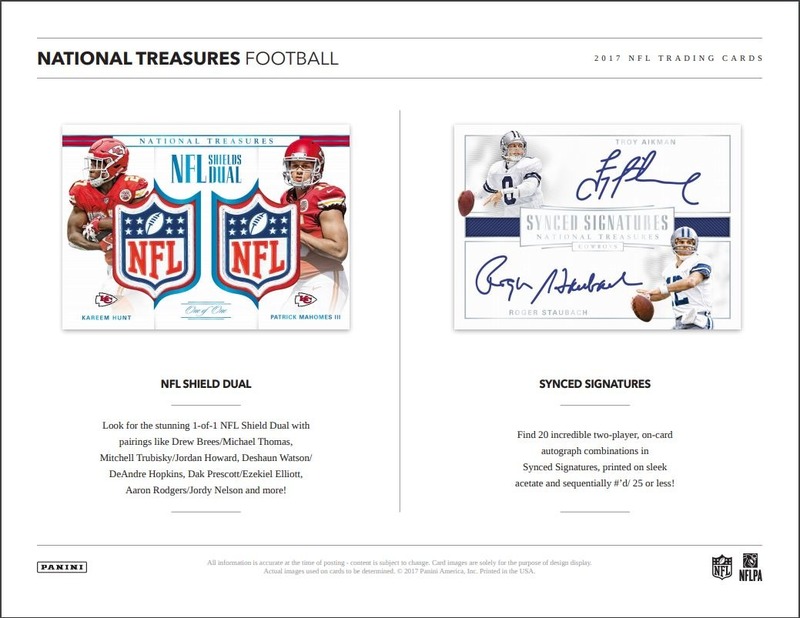 Look for the stunning 1-of-1 NFL Shield Dual with pairings like Drew Brees/Michael Thomas, Mitchell Trubisky/Jordan Howard, Deshaun Watson/DeAndre Hopkins, Dak Prescott/Ezekiel Elliott, Aaron Rodgers/Jordy Nelson and more! Find 20 incredible two-player, on-card autograph combinations in Synced Signatures, printed on sleek acetate and sequentially #'d/ 25 or less! 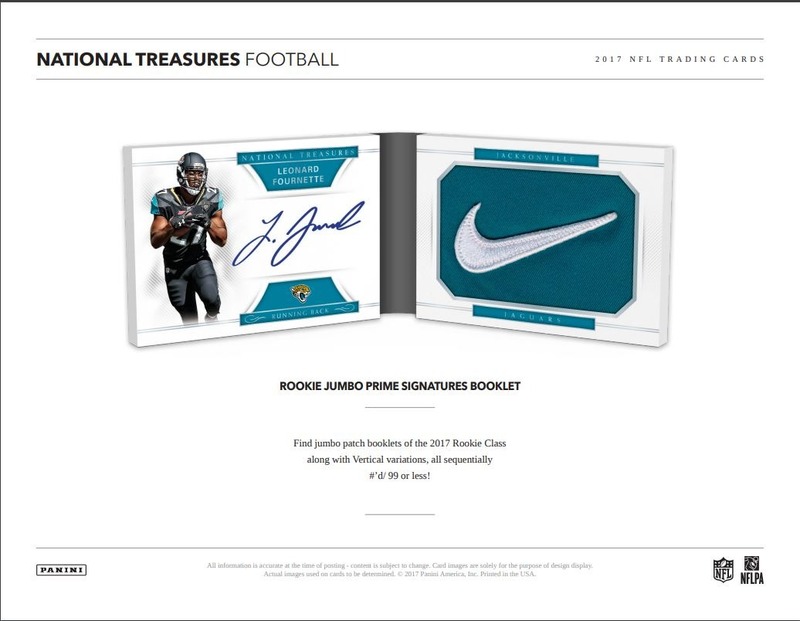 Find jumbo patch booklets of the 2017 Rookie Class along with Vertical variations, all sequentially #'d/ 99 or less!